Students of Monash University Malaysia (MUM) from Chemical Engineering Discipline emulated the performance of their seniors to clinch the first place in the 2nd Chemical Engineering Design Competition (2014). The finals of this event was organized by the Institution of Engineers Malaysia (IEM) on 26/04/2014. The victory this year by the Monash Chemical Engineering teams sent out for the design competition became even more rewarding when another group of students from MUM also finished second behind their peers. Design Project is a capstone project undertaken by the final year students in which students work in a team and apply the knowledge they have gained throughout the course to design an industrially important process. 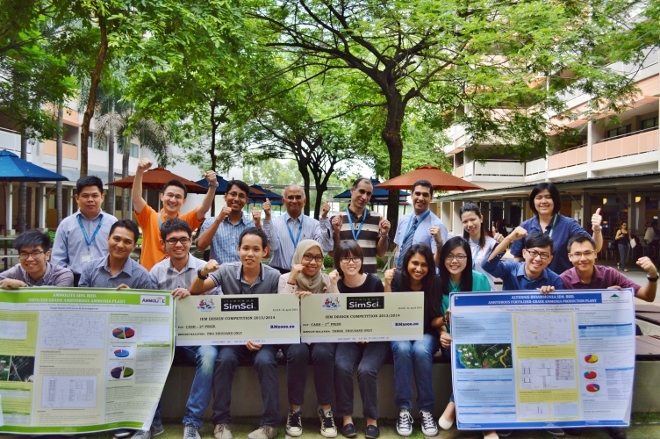 Monash’s winning projects in the Chemical Engineering Design Competition this year were based on the production of ammonia using palm biomass, a feedstock which is abundant, sustainable and economical in Malaysia for chemicals production. In this design competition, participants were required to make two rounds of report submission. Out of all the preliminary submissions, only a total of 8 teams from universities around Malaysia were shortlisted to submit a final report and present their plant design to panel judges. The judging panel consists of members from universities and industries such as Shell, Petronas and Invensys. The winning team members are Leong Hwee Lee (leader), Nisha Thavamoney, Jenny Wee Li Yap, Lydia Li-Ya Yap and Fatimah Aziah Riyadi, while Yu-Loong Low (leader), Muhammad Adib Norshariffudin, Nicholas Wongso, Tommy Chandra and Hock Tai Tan bagged the second prize of the competition. The champions and runner-ups were awarded a cash prize of RM3000 and RM2000 respectively from this competition. One of the judges commended that the overall performance by Monash students was of professional standard. Dr. R. Nagasundara Ramanan, the unit coordinator of the design project, thanked the committment and contributions of students and lecturers to make this achievement possible. The Discipline Head for Chemical Engineering, Associate Professor Chan Eng Seng remarked “We not only have won the design competition two years in a row; we have also achieved a dream victory this year by finishing 1-2. The success of our students desmonstrates our commitment to provide the highest quality of education at Monash University”.